Whether they are curled up at your feet on a cold winter night, or hunting lizards in the tall summer grass, cats make the purr-fect companions in all seasons and for a myriad of reasons. In this coloring book celebrating our feline friends, South Florida artist Robyn Henoch's original illustrations are waiting for your special touches, complemented by words of wisdom about cats through the ages. 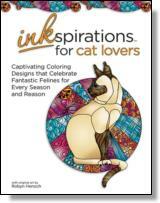 Inkspirations for Cat Lovers includes realistic depictions and imaginative creations, detailed designs and simpler patterns, long-haired and short-haired cats and kittens, purebreds and alley cats. With helpful tips on how to customize your creations and choose your hues, the lay-flat binding and perforated pages make it easy to color and share your completed pieces. There's plenty of love—and fur—for everyone in this tribute to our whiskered companions who color our world brighter every day. Cats bring color to our lives with their playful antics and particular style. We love them for their independent nature, their graceful movements, their athletic prowess, and their quiet, calming presence. In this tribute to fantastic felines, honor the cat companion in your house by unleashing your inner artist and bringing out the many dimensions and details of these unique drawings. Experiment and have fun; use realistic tones or a rainbow of hues—it's all up to you! Paired with inspiring quotes about the wisdom of cats, we hope this book allows you to unplug, unwind, and discover talents you didn't realize you had. Coloring is supposed to be a stress-free, no-worries activity. There really is no right or wrong way to do it. But if you'd like to take it to another level, here are some step-by-step instructions and helpful tips that can take your pages from meow to wow, as you can see in the example on the following pages. Step 1 Pick your palette. For this example, we chose gold and brown tones for the cat. If using pencils you can get different variations of the same color by applying more or less pressure with the colored pencil. Begin with light pressure and then use a heavier hand if you want a more intense shade, or add more of the same color on top to get the layered effect that will add interest to your picture. Step 2 Think about the light source in your picture; the shading of the fur depends not only on the color of the cat but the way that the light is hitting the cat's fur, and from which angle. Light and shadows add depth to the drawing. Step 3 As you color, make certain that your strokes go in the same direction that the fur grows on a cat. It's easy to see this in most of the illustrations. Step 7 Color in the eyes and nose to complete the cat. COLORING THE DETAILS—You'll notice that many designs are made up of unique doodled designs. You can color each individual element on its own in a separate color, or you can fill in one larger group of shapes in one color. ©2016 HCI Books. All rights reserved. Reprinted from Inkspirations for Cat Lovers: Captivating Coloring Designs Celebrating Fantastic Felines for Every Season and Reason. No part of this publication may be reproduced, stored in a retrieval system or transmitted in any form or by any means, without the written permission of the publisher. Publisher: Health Communications, Inc., 3201 SW 15th Street, Deerfield Beach, FL 33442.